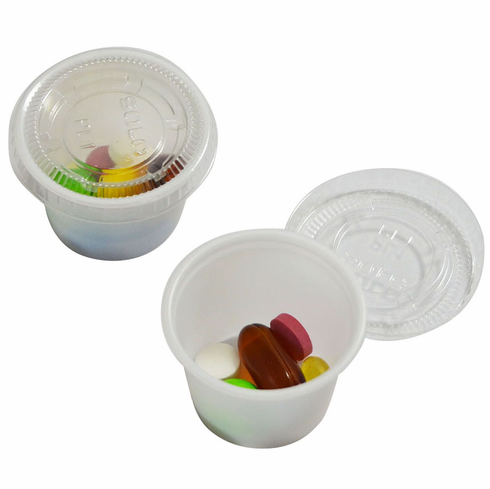 Replacement Cups (200 cups) + replacement Lids (200 lids) for your e-pill MD.2, MD2, MD-2, PMD or Philips Medication Dispenser. Size: The Medicine Cup is round 1 3/4 inch (44 mm) top diameter, and is 1 5/16 inch high (33 mm). Each cup needs a snap-on lid (included). Link to the new e-pill MD.2 Medication Dispenser. Order MD2/PMD Supplies (Philips Medication Dispenser) | Loading TRAY | Spare KEY.